Revolution opened its doors in late 2011, a family run bike park set up by two brothers with the ambition to create a bike park to cater for experienced Downhillers. Since opening, Revolution has grown from 1 trail and 30 riders a week to over 250 riders a week and offering miles and miles of trails ranging from smooth freeride to extreme natural downhill. With highlights including our top to bottom Red Freeride trail offering 3 minutes of flow riding with every type of jump you can imagine and at the other end of the spectrum the world famous 50/01 Pro Freeride, one of the biggest jump lines in Europe. 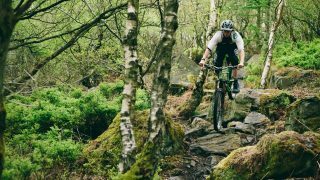 The variety of trails means that anyone comfortable on a mountain bike can have a fun days riding, challenge themselves and really progress their riding ability. The park is Uplift only, with a 300m vertical climb on the hill the push up would be a killer. Our fleet of 10-seater landrovers with custom trailers can lift you to the top of the hill in less than 5 minutes, meaning you get as much time on your bike as you can handle. Average runs per day is about 13-15 with the record being 26. The park operates Fri-Sun every week, pre-booking is required through the website as spaces are limited. The park also does midweek uplifts once a month and can offer private days as well. Check out the website for more details. The park has onsite catering providing breakfast, lunch, posh coffee and snacks. The park also has bike wash facilities, toilets and is developing changing facilities and showers in time for summer 2019. Through our partnership with Madison Saracen we have 2019 Saracen Myst Downhill bikes available for hire via the website. Uplift Days run from 10am – 4pm every day. 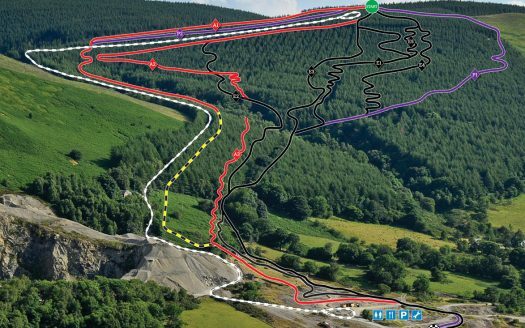 Revolution Bike Park is situated in the village of Llangynog in North Wales. On entering the village from the Shrewsbury/Oswestry direction follow the main road until you see a red brick converted chapel before a single track bridge. Just before this there is a left turn, take this turn and follow the road for 300m, the park is on your left. Postcode for Sat Nav users is SY10 0EP. The trail centre is located in Llangynog, Oswestry, SY10 OEP. You can follow the Revolution team on Facebook. The variety of trails means that anyone comfortable on a mountain bike can have a fun days riding.